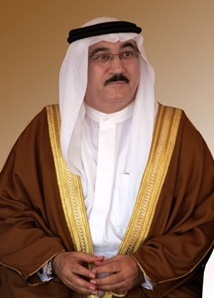 • Dr. Muhammad Abdul Ghaffar presented his credentials to former President François Hollande on September 8th, 2015, as Ambassador Extraordinary and Plenipotentiary of the Kingdom of Bahrain to the French Republic. • Advisor to His Majesty the King for Diplomatic Affairs (Royal Decree n°57), from June 29th, 2009 until December, 6th, 2014. • Chairman of the Board of Trustees for the Bahrain Center for Strategic, International and Energy Studies, from December 9th, 2009 through to February 5th, 2015. • Dr. Abdul Ghaffar has previously been appointed as Ambassador Extraordinary and Plenipotentiary of the Kingdom of Bahrain to Belgium in 2008, as well as Ambassador to the European Union in Brussels and non-resident Ambassador to Luxembourg (2008-2009). • He was appointed Minister of Information in 2006 (Royal Decree issued on December 11th, 2006), and as both Minister of Information and Minister of State for Foreign Affairs on January 14th, 2005. • He was appointed Minister of State for Foreign Affairs from April 17th, 2001 and again on November 11th, 2003. • Ambassador of Bahrain to the United States of America from 1994 until April 2001 and non-resident Ambassador to Canada from 1996 and to Argentina from 1998 until 2001. • Ambassador and Permanent Representative of Bahrain to the United Nations from August 1990 up to 1994. • He also participated, as a member o Bahrain’s delegation, in Sessions of the UN General Assembly from 1979 until 1984, and has taken part in the Gulf Cooperation Council Summit Conferences, as well as those of the Arab League and Non-Aligned Nations. • Dr. Abdul Ghaffar’s first diplomatic appointment was at the Embassy of Bahrain in Jordan from 1977 to 1979 and he worked in the Diplomatic Corps since 1975. - He obtained a Ph.D. in Political Science from State University of New York at Binghamton, in 1991. - He also obtained a Master’s Degree Political Science from the New School for Social Research in New York, in 1981. - He received his Bachelor’s Degree in Political Science from Poona University, India, in 1974.